Primitive Cream Saltbox Hand Painted Tissue Box Cover. 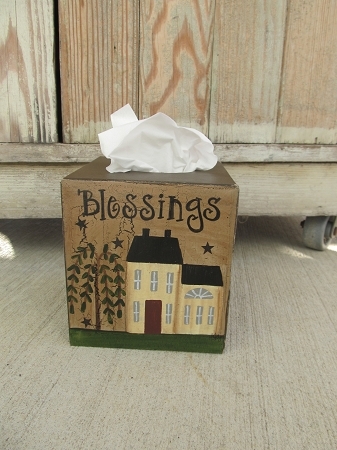 Our signature saltbox house is now on a tissue box cover. Perfect for your year round primitive decor. A cream colored saltbox house with a willow tree. Black stars painted around and the saying choice and side color is up to you. 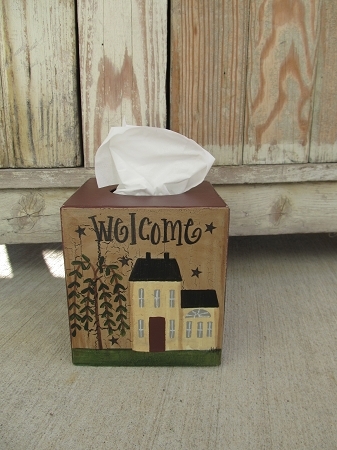 Paper mache cover holds boutique style tissue boxes. Size is 5"x5"x5". Edges are distressed slightly and sealed with a matte finish. Hand painted, designed and signed by Heidi.